I first visited the boutique Hard Days Night Hotel in Liverpool in October 2007 for a pre-opening tour. Traveling to Liverpool is a requisite pilgrimage for Beatles fans -- yes, we did sing Gerry and the Pacemakers' "Ferry 'Cross the Mersey" on the boat ride over (!) -- and this hotel now offers a fitting place for rest and contemplation. 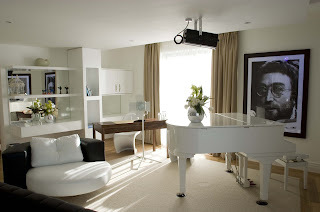 Two lavish penthouse suites reflect the personalities of John Lennon and Paul McCartney. 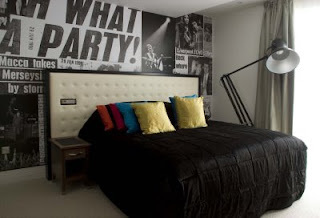 Other guest rooms and public areas also tell the Beatles story through artwork and memorabilia. The hotel is located in the Beatles quarter of Liverpool on the corner of Mathew Street, just yards from the famous Cavern Club where the Beatles started their career. The Hard Days Night has two restaurants, two bars, and just this week opened a two-level Beatles superstore. Not only will you be able to get official Hard Days Night Hotel merchandise and other Beatles souvenirs, but you will also be able to experience “The Gallery” which will house many exhibitions and events throughout the year. Now's a great time to visit -- package prices start as low as £125.00. Fly into Manchester for a quick visit to this architecturally interesting city with its unusual underground Temple of Convenience Bar and industrial grittiness. From Manchester it's a quick trip to Liverpool, and it's far easier than dealing with Heathrow. This is way too cool... I wish I could move in permanently! Who designed it?